Wine Pairings for Tex-Mex: Wine not? I would be remiss if I didn’t add two important references to this rundown. Those who want to cook should check out Robb Walsh’s excellent The Tex-Mex Cookbook: A History in Recipes and Photos; those who want to drink (wine, that is) ought to take a gander at Russell Kane’s authoritative and engagingly readable The Wineslinger Chronicles: Texas on the Vine. Texas Wine: Let the WIne Slinging Begin! Don’t worry, you don’t need to break out your rain poncho. No one is inviting you to an event where people will be slinging wine in your general direction. I am referring to a real wine slinger, but more along the lines of a Texas wine writer slinging good ole tales about the story of Texas wine, and I mean the whole story. In his chronicles, Kane sets out on a viticultural excursion to dispel the history, truth and future of Texas wine through a series of grape grower, vintner, winery stories as well as his own personal experiences along the way. He recalls the dinner at grower Neal Newsom’s B & B that’s the final chapter’s focal point. Which Texas wines taste good with fried rattlesnake or spicy mulligatawny soup? Just ask Russ Kane. 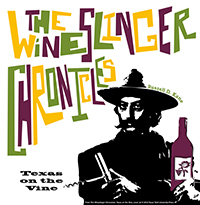 His book, The Wineslinger Chronicles: Texas on the Vine, uncovers all things related to Texas wines and neatly blends a range of wine topics as vast as Texas itself. “The Wineslinger Chronicles” is as comprehensive and as thorough a look at Texas wine as I have seen. Everything is there, from wine’s beginnings in Texas with the Spanish missionaries and their grapes, through the state’s pre-Prohibition history, and its rebirth in the 1970s. He tells the story through a series of visits to the state’s wineries and wine regions, from Val Verde Winery near El Paso to the mega-producer Ste. Genevieve in the almost unreachable Fort Stockton to the tourist mecca in and around Fredericksburg. Most people know Russ Kane as VintageTexas, the self-proclaimed Texas Wine Czar. @VintageTexas is his Twitter name and accordingly he writes a blog called Vintage Texas in which he imparts his knowledge of Texas wines and his experiences traveling throughout Texas and other wine regions in the United States. I was visiting a Texas winery near the start of my winery visits and after talking to the winemaker for a while, he said I should really follow Vintage Texas as I would learn a lot. That is exactly what I did and indeed I have learned quite a bit from reading Russ’s VintageTexas Blog. If you have any interest in Texas wine and the history of Texas wine, I would highly recommend ordering your copy. The book is available for pre-ordering at most online bookstores and you can even order an autographed copy directly from Russ himself at his Wineslinger website. The book will also be available as an eBook [and hardcover on Amazon.com and Barnes & Noble].